People seek legal representation for various reasons, but they all have one common expectation: what they divulge to their lawyer in trust will be kept confidential. Confidentiality is perhaps the hallmark of the client-lawyer relationship.Under the Rules of Professional Conduct, a lawyer must not reveal information relating to the representation of a client unless the client gives informed consent or the disclosure is otherwise permitted or required. (1) The law gives effect to this confidentiality principle through the attorney-client privilege,the work product doctrine, and the rules governing attorney ethics. So what happens when a lawyer is called as a witness or otherwise required to produce evidence concerning a client? What happens when a client himself shares protected information with a spouse? Here we detail how South Carolina courts apply the attorney-client privilege and work product protection in judicial and other proceedings. 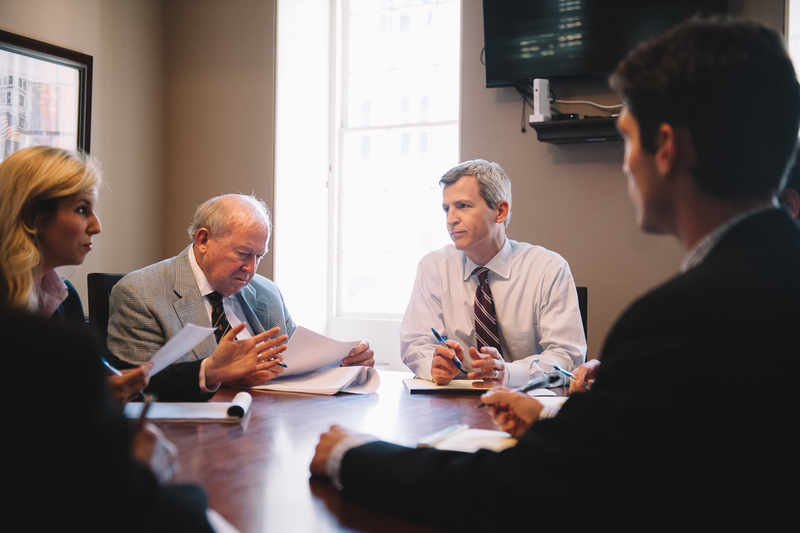 The attorney-client privilege has long been recognized in the state of South Carolina. When raised, the privilege excludes from evidence confidential communications of a professional nature between an attorney and her client. (2) This means that an opposing party cannot obtain emails between a lawyer and her client, or that an opposing counsel cannot cross-examine the client on matters discussed between the client and his lawyer. Who does the privilege protect? The attorney-client privilege protects the client and is determined from the client’s point of view. It also prevents any other person from disclosing confidential communications that the client made to a counsel relative to a legal matter. (7) Simply put, the privilege belongs to the client, not to the lawyer or a third party. How is attorney-client privilege lost? The Marshall case involved a divorce action where both parties — Mr. Marshall and Mrs. Marshall — sought custody of their two minor children. Mrs. Marshall inadvertently left a letter from her attorney, addressed to her, in Mr. Marshall's pickup truck. (18) The parties were separated at the time. In addition, Mrs. Marshall’s attorney routinely had sent copies of his correspondence with Mrs. Marshall to her father, Mr. Charles Johnson, who was the surety for the payment of his daughter's attorney fees. (19) At the trial, the judge refused to allow any of the attorney’s letters to Mrs. Marshall into evidence on the basis of the attorney-client privilege. (20) The trial court awarded custody of the children to Mrs. Marshall, and Mr. Marshall appealed. This case shows us is that you must take precaution with legal case-related matters shared with anyone aside from your lawyer. While family members may be close to you and have an interest in the outcome of litigation, disclosure of privileged communications would likely be deemed to waive the attorney-client privilege as to all communications on the same subject. When privileged communications are disclosed to a family member, the court must then decide whether the family member also became a client of the attorney. If they did not, as in Marshall, the information contained in the communication could be admissible in evidence if it is relevant. What information is not protected by the privilege? This doctrine can be found in South Carolina Rule of Civil Procedure 26(b)(3),(34) and its federal counterpart, Federal Rule of Civil Procedure 26(b)(3). To resolve the question of whether matters are immune from discovery because of the work product doctrine, courts first must analyze: 1) whether the documents or tangible things were prepared in anticipation of litigation or for trial, and 2) whether the requesting party has demonstrated a substantial need for materials other than legal opinion or theory. When does a requesting party have “substantial need” for the information? Take for example the case Nat'l Union Fire Ins. Co. v. Murray Sheet Metal Co., 967 F.2d 980, 985 (4th Cir. 1992) as instructive. On April 4, 1990, a fire broke out in a GE plastics plant located in West Virginia, at a location in the plant that was being renovated by Murray Sheet Metal Company. Although the direct fire damage was minor, extensive polychlorinated biphenyl (PCB) contamination was discovered in the area, causing widespread damage and cleanup costs in the millions of dollars. The insurance company providing coverage to GE for the plant undertook to pay the losses, including cleanup costs, and instituted suit against National Union Fire Insurance Company for reimbursement under a reinsurance agreement. National Union resisted payment because it believed that the PCB contamination was not caused by the fire but rather was a preexisting condition at the site, and was therefore not covered by its insurance. Shortly after the fire, Murray Sheet Metal Company began an investigation into the circumstances of the fire and the PCB contamination. With its own employees, it gathered data concerning the PCBs, conducted medical tests of its employees, and obtained statements from Murray employees who worked at the plant. The two insurance companies subsequently filed suit to resolve the proper apportionment of losses occasioned by the fire. National Union issued a subpoena to the custodian of records of Murray Sheet Metal Company, requesting that it produce documentation relating to the fire and Murray’s investigation of it. Murray refused to produce twenty-six of the requested documents, contending, among other things, that the documents constituted work product. National Union then moved to compel production of the documents. The district court denied the motion solely based on Murray's description of them, without reviewing the documents. National Union appealed to the Fourth Circuit. The Fourth Circuit noted that several of the documents were written witness statements taken by Murray's safety director and others on April 5, 1990, one day after the fire. Because the statements were taken by persons charged with safety responsibilities, the Murray Court questioned whether the documents were prepared in anticipation of litigation or for trial. The court assumed they were and found they did not contain opinions and trial strategies, so it then analyzed whether National Union had demonstrated a substantial need for their production. The Murray Court then addressed a second set of documents authored by a Murray employee whose position was not specified. (49) The court acknowledged that “work product need not be the direct product of an attorney,” but found it telling that the employee prepared many of the documents before ever contacting counsel or the insurance company. (50) Thus, the court doubted whether they were prepared because of litigation. If they were not prepared in anticipation of litigation, they would be discoverable. If they were found to be prepared in anticipation of litigation, the court would have to decide whether the requesting party demonstrated a substantial need for them. The attorney-client privilege and work product doctrine are useful weapons in a client’s arsenal. A client can rest assured that matters pertaining to his representation are safe from disclosure to an opposing side, as long as the appropriate precautions are taken not to waive the privileges. At Duffy & Young, we take your trust seriously. We can provide you the legal information you need on attorney-client privilege, the work product doctrine, and more. (b) A lawyer may reveal information relating to the representation of a client to the extent the lawyer reasonably believes necessary: (1) to prevent the client from committing a criminal act; (2) to prevent reasonably certain death or substantial bodily harm; (3) to prevent the client from committing a crime or fraud that is reasonably certain to result in substantial injury to the financial interests or property of another and in furtherance of which the client has used or is using the lawyer's services; (4) to prevent, mitigate or rectify substantial injury to the financial interests or property of another that is reasonably certain to result or has resulted from the client's commission of a crime or fraud in furtherance of which the client has used the lawyer's services; (5) to secure legal advice about the lawyer's compliance with these Rules; (6) to establish a claim or defense on behalf of the lawyer in a controversy between the lawyer and the client, to establish a defense to a criminal charge or civil claim against the lawyer based upon conduct in which the client was involved, or to respond to allegations in any proceeding concerning the lawyer's representation of the client; or (7) to comply with other law or a court order. 2. Drayton v. Industrial Life & Health Ins. Co., 31 S.E.2d 148, 152 (S.C. 1944) (emphasis added). Generally, the party asserting the privilege must raise it. 3. Marshall v. Marshall, 320 S.E.2d 44, 47 (S.C. Ct. App. 1984)(citing State v. Love, 271 S.E.2d 110, 112 (S.C. 1980). 4. Floyd v. Floyd, 615 S.E.2d 465, 483 (S.C. 2005)(citing Marshall, 320 S.E.2d at 47). 7. Id. (citing Ross v. Medical University of South Carolina, 453 S.E.2d 880, 884 (S.C. 1994)). 8. See Rule 1.2, RPC, Rule 407, SCACR. 9. Crawford v. Henderson, 589 S.E.2d 204, 207-208 (S.C. 2003) (internal citations omitted). 10. State v. Hitopoulus 309 S.E.2d 747, 749 (S.C. 1983). 12. See Cloniger v. Cloniger, 193 S.E.2d 647, 652 (S.C. 1973) (holding that “[o]nly confidential communications are protected by the attorney-client privilege.”). 13. Love, 271 S.E.2d at 112; South Carolina State Highway Dep't v. Booker, 195 S.E.2d 615, 620 (S.C. 1973). 14. Hitopoulus, 309 S.E.2d at 749. 15. Marshall, 320 S.E.2d at 46-47. 17. Marshall, 320 S.E.2d at 46. 29. State v. Doster, 284 S.E.2d 218, 220 (S.C. 1981). 31. Rule 1.6, RPC, Rule 407, SCACR. 32. Booker, 195 S.E.2d at 620. 34. Tobaccoville USA, Inc. v. McMaster, 692 S.E.2d 526, 530 (S.C. 2010). 35. Nat'l Union Fire Ins. Co. v. Murray Sheet Metal Co., 967 F.2d 980, 983-84 (4th Cir. 1992). 38. Id. ; see also Fed. R. Civ. P. 26(b)(3) and S.C. R. Civ. P. 26(b)(3). 39. Tobaccoville, 692 S.E.2d at 530. 40. Nat'l Union, 967 F.2d at 984. 48. Id. (citing McDougall v. Dunn, 468 F.2d 468, 474 (4th Cir. 1972)). 49. National Union, 967 F.2d at 986.